About About Who are support staff? On Friday 23 November 2018 we celebrated the Stars in Our Schools. We've got plenty of resources to help you celebrate next year: a PDF guide, stickers, bags, drinks mats, template letters, a poster, a certificate, social media graphics... get ordering and get downloading! A PDF showing all the branded materials available to order from the UNISON catalogue and from TC Branding. Everything you need to know about celebrating the stars in your school. Print out and share our recipe for delicious star-shaped cookies! Why not order some paper bags and fill them with cookies for the stars in your school? Download these stickers so that everyone knows who the stars are on the day. UNISON branches can order in bulk via the online catalogue. Stock number 3488. UNISON branches can order in bulk via the online catalogue. Stock number 3984. Wear your support for school staff on your sleeve, or your collar, or anywhere you like really. UNISON branches can order in bulk via the online catalogue. Stock number 3490. UNISON branches can order in bulk via the online catalogue. Stock number 3605. UNISON branches can order in bulk via the online catalogue. Stock number 3662. UNISON branches can order in bulk via the online catalogue. Stock number 3983. Fill in your information and send this to your local paper to publicise your event. Use this Stars in Our Schools poster template to add details of your event and stick around your school. 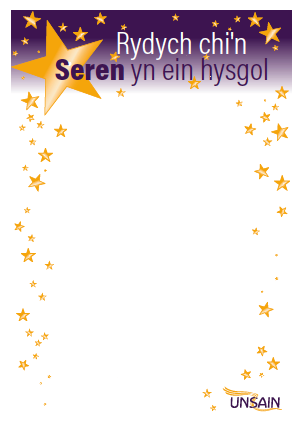 Use this Welsh Stars in Our Schools poster template to add details of your event and stick around your school. Make your appreciation official – give the stars in your school a certificate. Download this Welsh version of the email header. Use this graphic on your Stars in Our Schools materials. Want to show your love for the stars in your school online? Create a social media graphic by adapting this powerpoint slide to include your school's details. Promote your event, or send out a message of support (the file will download when you click on it). Change your Facebook cover photo to tell everyone about the celebration day! Download and print A3 signs for photo opportunities. Leaflet: What is a trade union? If you'd like to let people know what UNISON is all about, download and print this leaflet. Visit UNISON's Skills for Schools website for useful links and more information on career development. School support staff make up over half of the school workforce, but some can tucked away behind the scenes. As part of of UNISON's campaign to speak up for school support staff, we are holding a celebration day on Friday 28 November 2014, and encouraging all schools to get involved. Stars in Our Schools is a UNISON initiative. Find out more about UNISON or Join UNISON today.